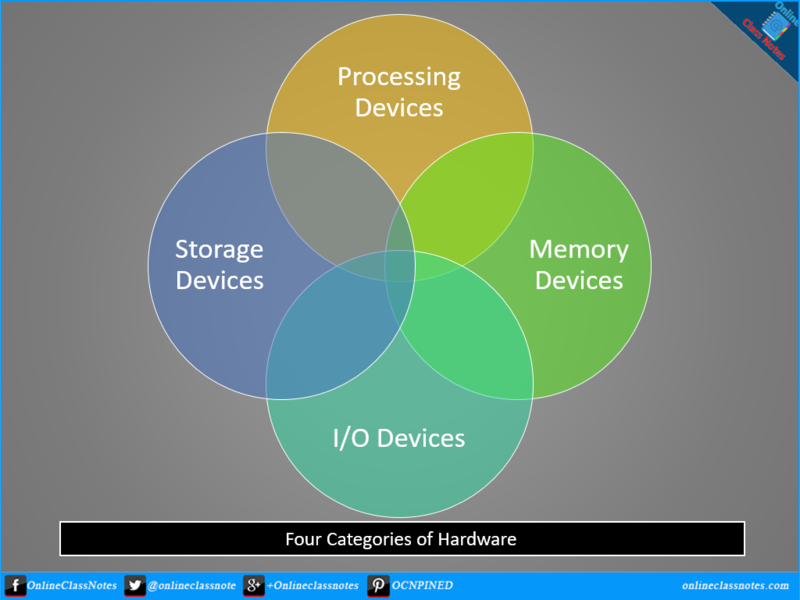 What are the 4 Types of Computer Hardware? Computer Hardware is any part of the computer that can be touched. These are primarily electronic devices used to build up the computer. Computer Hardware actually perform the computing operations along with taking input and outputting the computed result or to store that. There are four categories of computer hardware, they are being described below. The main goal of a computer is to process raw data to generate useful information, which is a step of the information processing cycle. Those computer hardware which are involved in processing data are the processing devices. Primarily two devices are involved in processing, the processor and memory. However, these two devices are part of the motherboard, which is the central circuit board that holds these devices along with other devices. A memory device, as it's name implies, is a device that stores data. However, unlike storage devices, memory devices are very fast and expensive. Memory devices can be volatile or non-volatile, both. Among various types of memory, two most used are RAM and ROM. RAM is a volatile type of memory, the data stored in RAM will be cleared when computer is turned off. On the other hand, ROM is non-volatile. However, data in ROM can not be changed as it is read-only. Memories are used by CPU and programs, not by user. Input devices are used to take input from user, and output devices are used to output result to user. Any device that are being used by an user to give instructions to computer is a input device such as keyboard, mouse, microphone etc. On the other hand, any device that the computer uses to send result to user is an output device such as monitor, printer, speaker etc. Storage devices are like memory devices but they are different as storage devices can keep data when the computer is turned off, can be used to store data both by a program and an user. Most used storage device is HDD or hard-disk-drive. There are many other storage devices, like optical disks, magnetic tapes etc. Though input and output devices are two different types of devices, a single device can be both, an input and an output device, such as a monitor with touch screen. User can use the touche screen for input and computer can use the touch screen to display results.